10 Things You Might Not Know About STAR TREK INTO DARKNESS | Warped Factor - Words in the Key of Geek. Geek Dave is genetically engineered to be superior. 1. 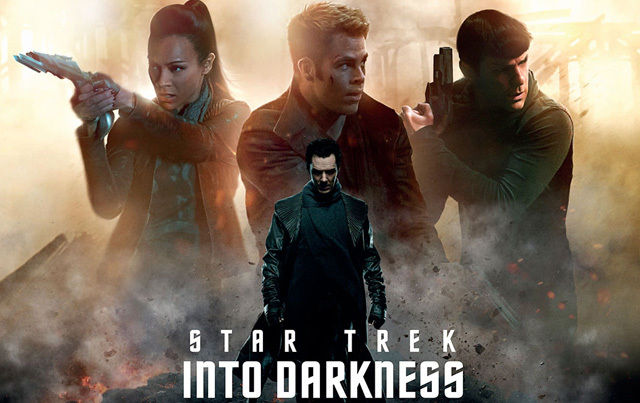 A sequel to 2009's Star Trek was announced in March 2009, before the first film's release, when it was reported the team of J. J. Abrams, Bryan Burk, Damon Lindelof, Alex Kurtzman and Roberto Orci would all return for a second film. Paramount were keen to get this one together quickly and hoped for it to go before the cameras early 2010 with a 2011 release date. Kurtzman and Orci began writing the script in June 2009, with their original intention being to develop a story which could be split into two parts for two movie installments to be shot back to back. By early 2010, the release date was pushed back to June 29th 2012, and Damon Lindelof announced he had begun working on the script with Kurtzman and Orci, and that the three of them had started over, created an outline for a new story which, instead of being a sequel, would now be a single stand-alone film. 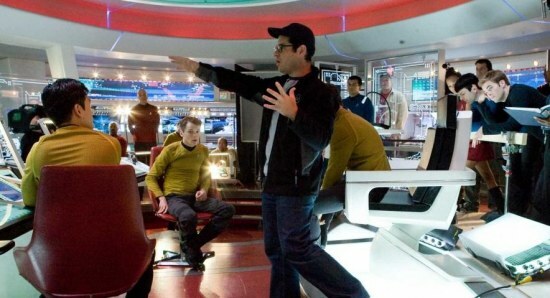 Come January 2011, J.J. Abrams revealed that he had not decided whether or not he would direct, since he had not yet seen a script, as the writers had, once again, decided to scrap everything they had so far. Abrams, Kurtzman and Orci said that selecting a villain was difficult, but they had discussed the possibility of using Khan Noonien Singh and the Klingons. In February, Orci tweeted that he (with Lindelof and Kurtzman) planned to deliver the final script in March 2011. He didn't. But in April, at WonderCon, Orci said that the script's first draft had finally been completed. However, due to his schedule on Super 8, it wasn't until September of that year that Abrams agreed to direct the film, with the release date now being pushed to either winter 2012 or summer 2013. Principal photography finally began on January 12th 2012, two years after the original intended filming schedule. 2. 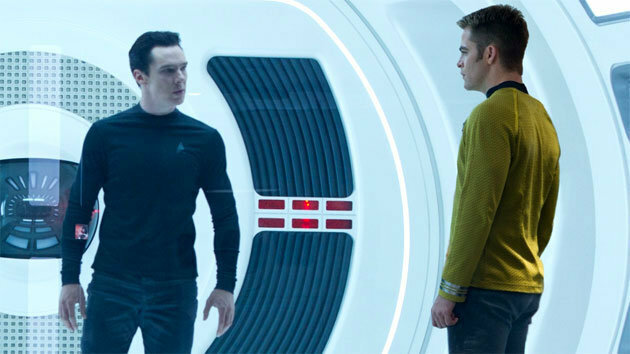 Star Trek Into Darkness was a first amongst Trek films, in that it treated the word 'trek' as a verb instead of a noun for the first time in the entire series. Unsurprisingly it wasn't the first choice of title, for a long time the film was to be known as Star Trek: Vengeance, but that was eventually dropped because the producers felt 'Vengeance' was a word that had been used too often in movies (Die Hard with a Vengeance, Ghost Rider: Spirit of Vengeance and, er, Furry Vengeance? for example). "...everything that people are turned off about when it comes to 'Trek' is represented by the colon." Not sure I totally agree with that statement, do you? "[Khan] has such an intense gravity in the Trek universe, we likely would have expended more energy NOT putting him in this movie than the other way around." 4. Actor Benicio del Toro was originally sought out to portray Khan. He met with J.J. Abrams and seemed to be locked in for a long time, however after all the delays in production del Toro chose to bow out. Edgar Ramirez and Jordi Molla were then both approached. Mexican actor Demián Bichir was briefly linked to the part too, but as reported on January 4th 2012, Benedict Cumberbatch was cast in the role of 'John Harrison'. "I got a call before Christmas Eve saying that they’re very interested in you playing the not-so-good guy in the next “Star Trek” film. Can you get yourself on tape? So I rang some friends of mine – and when I say friends, I mean the top casting directors in England who were all on holiday because we observe this little Judeo-Christian cult holiday called Christmas. And the demands were coming in so fast, I was like, This is terrifying. And by the 27th, people were knocking on the door, literally, and saying I’ve got to put myself on tape. I was down in Gloucestershire with some friends, who turned out to be useless. I won’t mention their names, they’re quite well known friends, a director and a very brilliant actress. Bless them, they were busy with his kid. I then went down to London and begged my best friend there, Adam Ackland. He’s always been there to put out the fire. And he said, “Let’s do it.” My Flip wasn’t working, I couldn’t get any kind of recording device. I said, I’m going to do it on my iPhone. It’s high quality, it’s HD. It will be fine. I was furious. And then I heard on the day after New Year’s Day – we had an amazing first showing for [the British season premiere of] “Sherlock,” and then he just sent me an e-mail, going, “You want to come and play?” I said, What does this mean? Are you in town, you want to go for a drink? I’m English, you’ve got to be really straight with me on this. Have I got the part?" 6. Leonard Nimoy originally announced that he would not be involved in Star Trek Into Darkness, however his appearance marked the eighth time he'd played Spock in the Star Trek film series, breaking the seven appearance record jointly held by William Shatner, James Doohan, Walter Koenig and Majel Barrett at that time. 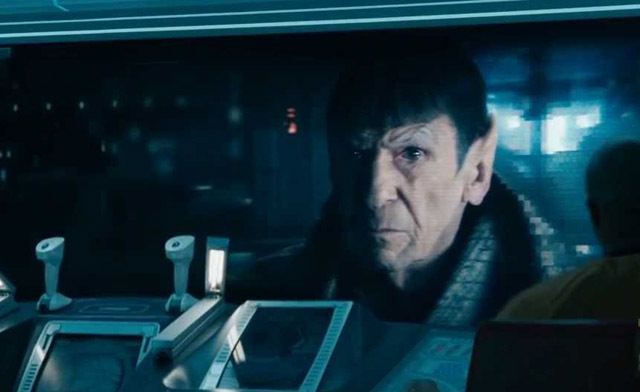 This brief appearance marked Leonard Nimoy's final acting role before his death on February 27th 2015 at the age 83. 7. Talking of record breaking appearances, although this time on the small screen, we turn to Michael Dorn who holds the record for most number of appearances in Star Trek television episodes. His character of Commander Worf was featured as a principal cast member on both Star Trek: The Next Generation and Star Trek: Deep Space Nine, and during production it looked like everyone's favorite Klingon was going to make an appearance in Star Trek Into Darkness as a Kilngon soldier. Sadly, plans ultimately fell through. 8. Among the many 'homages' in Star Trek Into Darkness is one involving Karl Urban's Dr. McCoy and a Tribble, one of the most iconic creatures in all of Star Trek's history. The Tribble was brought to life through practical effects rather than CGI, but did you know that the puppeteer was none other than J.J. Abrams himself? 9. 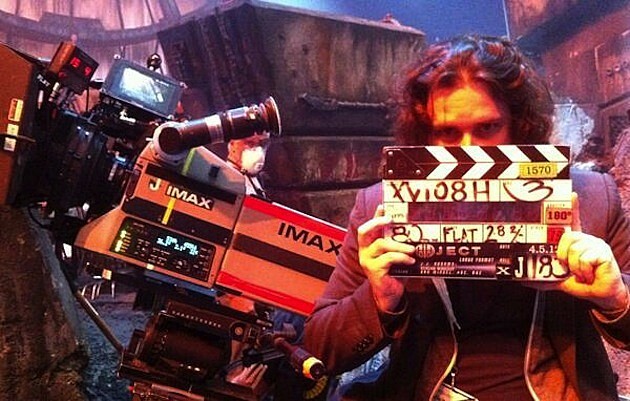 Simon Pegg's pal, director, Edgar Wright paid a visit to the Star Trek Into Darkness set and ended up guest directing one shot of the film! It's never been revealed exactly which shot but from the look of the picture he posted on Twitter it's one which takes place on Kronos, the Klingon home planet. "J.J. Abrams and company shoehorned a major villain from the original series for little reason other than marketability and then spent the next year or so lying to everyone and claiming said villain wasn’t in the picture. 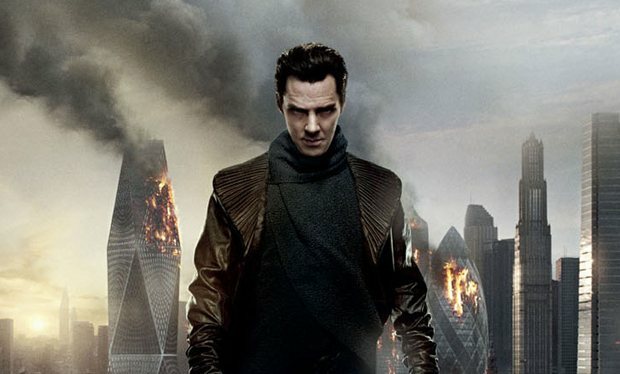 With no added value elements to sell, Paramount was forced to craft a generic campaign based around Benedict Cumberbatch as "Generic Bad Guy", so the excitement never took hold. This was adding to the idea that merely withholding basic story elements is tantamount to promising stunning plot twists." Nicely put. Now what about all that lens flare?? ?